TSRTC Notification 2017 by TSPSC/ TSPSC To Conduct Recruitment For 279 Posts in TSRTC: The Telangana State government sanctioned 279 posts in the Telangana State Road Transport Corporation (TSRTC) for filling up the vacancies. The candidates may expect the TSRTC recruitment notification for these posts soon. The total 279 posts include vacancies Junior Assistants (personnel), Junior Assistants (Finance), Traffic Supervisors and Mechanical Supervisor Trainees. 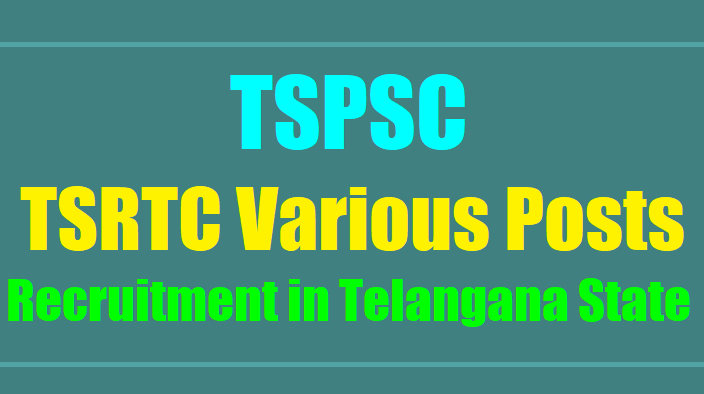 Telangana State Public Service Commission (TSPSC) will be conducting the recruiting process for these posts. The official notification for these posts are expected to be released soon. Telangana state government approved filling of 279 posts after careful examination of the proposal furnished by the state transport department. The government also considered the actual requirements of manpower with reference to the nature of work and activities of the TSRTC and also overall financial implications, reported Telangana Today. According to the report, the state finance department has now requested the Telangana State Public Service Commission (TSPSC) to take necessary actions to fill the vacancies through direct recruitment by obtaining local cadres as per the Presidential Order and roster points. G.O.Ms.No. 171 Dated: 22-11-2017: GOVERNMENT OF TELANGANA - FINANCE (HRM-II) DEPARTMENT- Public Services – TR&B Department - Recruitment – Filling of (279) two hundred seventy nine posts in Telangana State Road Transport Corporation (TSRTC) through the Telangana State Public Service Commission, Hyderabad - Orders – Issued. 1. TR&B (TR-II) Department, U.O.No.4155/Tr.II/2017, dt.09.11.2017. ORDER: Government have reviewed the Direct Recruitment vacancy position in Telangana State Road Transport Corporation (TSRTC). After careful examination of the proposal furnished by the Department and keeping in view the actual requirement of manpower with reference to the nature of work and activities of the TSRTC and also the overall financial implications, Government hereby accord permission to fill (279) two hundred seventy nine posts in Telangana State Road Transport Corporation (TSRTC) through the Telangana State Public Service Commission, Hyderabad as shown below. 3. The TR&B Department and the Managing Director, Telangana State Road Transport Corporation (TSRTC) shall furnish details of all vacant posts authorized in this order, including the local cadre wise vacancy position, roster points and qualifications, etc., to the recruiting agency immediately under intimation to Finance Department. The Department shall issue necessary amendments to their service rules / Government Orders as regards recruitment procedure / recruiting agency, wherever necessary, before issue of notification.